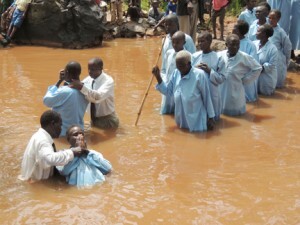 The Lord has been pouring out blessings in Kenya! As we see the signs of the times in the daily newspaper, on the news, in our churches, and everywhere we look, our prayer is that we will all be faithful servants and that we will be ready to meet the Lord when He comes. Last year began with an evangelistic series by Pastor Ivan Plummer in Etago, Kenya. Fifty-seven people were baptized at the close of these meetings and even more continued studying which led to additional baptisms throughout the year. As a result of these meetings, a new church group is meeting in Etago, land has been obtained, and a new church building will be erected this year. Over 150 people have been baptized this year in Kenya, and we just praise the Lord for what He is doing in the hearts of the people. “This money would erect humble houses of worship, something that the people really need, where they can meet to worship God…. Then you must go farther. A school building should be erected, and a school teacher employed to educate the children. Thus the whole community may hear the last message of warning.” Manuscript Releases, vol. 15, 251. After reading the above admonition, we built four schools in Kenya, and a fifth will be started this year. Over 600 children are currently attending these schools. There will be a greater effort to collect school fees this coming year to help offset some of the expenses of the teachers’ salaries, the text books, and the school upkeep. 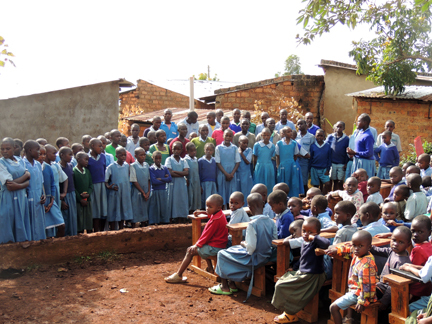 It is a joy to attend worship at the schools and hear the children singing to the glory of God. 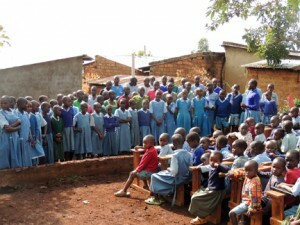 The orphanage in Ibencho, Kenya is doing well. It is a blessing to see the children growing in the Lord. Waking up in the morning and hearing the children singing for worship at 6:30 am gives us tremendous happiness. A donor from the Czech Republic visited the projects in Kenya over a year ago and he has requested that a second orphanage be built. He has donated the majority of the funds for this project. There will be additional expenses for equipment, and then there will be daily expenses for the workers and for the children’s needs. The responsibility for training children is a very serious matter. Please pray that the Lord will guide us to find the right people to work at the orphanage. The workers currently have over 200 children on the list for the 100 bed orphanage. They will evaluate the conditions in which the children are living and attempt to select the ones that are in the direst need. A home for widows opened at the end of 2013. It is for older women that have no family to help them. They went through a short period of adjustment—eating a vegetarian diet and worshiping on Sabbath–but they are happy and doing well. One of the widows said: “I am sure that I would have been dead by now if I were not living here.” She went on to say that she did not have proper food, had very limited clothing, slept on the floor, and no cared when she was sick. This is another opportunity to be a witness to the community and to the families of these women. Seven of the widows were baptized in 2014. The medical missionary work is another area that has expanded this year and plans are under way to expand further. “The work of health reform is the Lord’s means for lessening suffering in our world and for purifying His church. Teach the people that they can act as God’s helping hand, by cooperating with the Master Worker in restoring physical and spiritual health. This work bears the signature of heaven, and will open doors for the entrance of other precious truths. There is room for all to labor who will take hold of this work intelligently.” Counsels on Diets and Foods, 77. One of the many baptisms led by Advent Hope Ministries. A Pentecostal group of 35 began to study the Sabbath and after taking Bible studies for several months they were baptized along with their pastor and a church is being built for them. Another 25 members are still studying with one of the Bible workers. There is another group of former Sunday-keepers in Springhill; a school has been built there for them and a church is being constructed as well. There are six other groups that are waiting for churches to be built and another seven or eight groups that are waiting for worship shelters. The shelter is just a metal roof over poles. It protects them from the rain and the sun. Last November we had a final events presentation showing how prophecy is being fulfilled with crime, corruption, wars, and rumors of wars. Natural disasters are increasing, including fire, flood, drought, and earthquakes. Over 200 people attended these meetings, all walking from two to ten miles to attend. These people live in very rural areas and do not have access to television, so seeing the presentation on the screen made it much more impressive to them. Many people asked what they can do to be ready, so another presentation focused on developing the character of Christ and the need to be covered with His righteousness. The response was overwhelming. How we look forward to the day when there will be no more separation. Our prayer is to meet many of these people in Heaven. “Many are really perplexed to decide what gifts they can select that will give pleasure to those who are abundantly supplied with the good things of this life. Let the money usually expended for these gifts, flow into the Lord’s treasury.” Review and Herald, January 4, 1881. Please remember all of the projects that are mentioned in this magazine from Mission Projects International. By Bill and Becky Humeniuk of Advent Hope Ministries, Inc. Mail: Advent Hope Ministries, PO Box 100, Campbellsburg, KY 40011. Email: adventhope@hughes.net. Website: www.biblesforafrica.org.